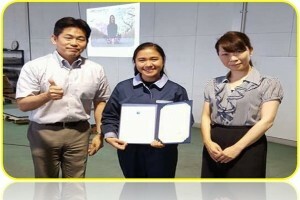 Femme Stefanie Naranjo is the first Mechanical Engineering student in the University of San Jose-Recoletos to be a part of the chosen students in the entire Philippines by the Ninomiya Manufacturing Company to render her internship in Japan. “It’s nice, it’s wonderful, it’s unforgettable, it’s not the opportunity that comes usually,” Femme Stefanie Naranjo said. “Many were hoping, but I was fortunate enough to be selected” she added. Naranjo is one of the Mechanical Engineering students that were interviewed to have an internship in Ninomiya Manufacturing Company Ltd., Japan. They were five applicants in USJ-R, and she was the only one chosen to be the first intern. She added that applicants were required to write an application along with explanation on why do they deserved the opportunity to be an intern of Ninomiya Manufacturing Company Ltd., Japan. “Intellectually capable, lively, and mature enough to deal with other races,” Naranjo said. She believed that she deserved the slot; her determination and motivation took her to Japan. She travelled to Japan alone. However, when she arrived Ms. Noriko Ninomiya, CEO and Mr. Yoshikuni Horiyasu, COO of Ninomiya Manufacturing Company Ltd., Japan accompanied her. She was monitored by Ms. Princess Juguilon (former secretary of the Dean of the College of Engineering) during her stay in Japan. The program started on March 27 up to June 25, 2017. The internship lasted for almost three months. This program is connected with the Monozukuri Intensive Course B. training which happened last year in October to November 2016. This Monozukuri training means the Art of Doing Things. She experienced doing things with her bare hands and learn how these products were made. The training also introduced Japanese culture, engineering aspects as well, and the Japanese ethics and work ethics. “So if you’re done with such training it becomes your edge to go to Japan. Plus I’ve been to Japan for the past year and I’ve already seen their work,” stated Naranjo. She was also a scholar in Tsuneishi Heavy Industries in Balamban, and served the company every summer for 15 days. Femme Stefanie Naranjo, Mechanical Engineering student intern, with Ms. Noriko Ninomiya, CEO (right), and Mr. Yoshikuni Horiyasu, COO (left) of Ninomiya Manufacturing Company Ltd., Japan. Language barrier is one of the most difficult things that she encountered that time. It’s hard for her to cope with the environment especially the people around her. She doesn’t know how to speak well in Niponggo, but just the basics. However, a Filipino worker in the same company named Pamela, helped her understand Japanese Language. Pamela, Ninomiya’s worker is an Industrial Engineer and a graduate at the University of San Carlos. She made Naranjo lessen her struggles in understanding the language. Japanese are known to be fast, efficient, and accurate when it comes to work. They are also open minded. Naranjo coped with these three aspects. She said that Japan was really a nice place. Her working hours is from 7am to 5pm. She added, her work experience was stressful yet challenging. So she really needs to work hard and cope with it. “When I went home my Japanese mentors gave me a big card, and they wrote all of their messages such as, thank you for your smile. They said that Filipinos always smile that’s why they want more Filipinos,” Naranjo said. They are encouraging fresh graduates from the Universities in the Philippines to work in their company. Presence of mind, and being physically fit are both needed in the workplace. The budget of plane ticket and accommodation was shouldered by Ninomiya Manufacturing. According to Naranjo, the CEO and COO were very good people, and treated her like their own child. This is Naranjo’s message for all aspiring students who wants to follow her footsteps. “You should trust yourself that you can do it, because when you’re in another country and you’re alone, no one can help you but only yourself, and you have to be versatile enough to cope with new environment, new people, new culture. Always do your best in everything you do and people will really appreciate it,” she said.